The timing of food intake is a major factor driving the rhythmic expression of most genes in the mouse liver, researchers report April 16th in the journal Cell Reports. The findings demonstrate that body-wide signals driven by rhythmic food intake significantly contribute to driving rhythms in liver metabolic functions and gene expression independently of the liver and clock. "In contrast to the prevailing model in the field currently, our findings indicate that feeding times do more than just synchronize the molecular clock in different organs—they actually can regulate rhythmic gene expression in parallel of the clock," says senior study author Jerome Menet (@jsmenet), whose lab at Texas A&M University studies the mammalian circadian clock. "This raises the interesting hypothesis that eating at the wrong time of the day, which is prevalent in shift-workers for example, can desynchronize rhythmic gene expression and lead to pathologies." Nearly every mammalian cell harbors a molecular circadian clock that drives rhythmic gene expression to coordinate daily cycles in metabolism, physiology, and behavior. These clocks are synchronized by the master circadian pacemaker located in a brain structure called the suprachiasmatic nucleus (SCN). The SCN uses multiple cues, such as rhythms in neuronal signaling, hormone secretion, body temperature, and food intake, to synchronize outlying clocks located in various organs throughout the body, ensuring that they are all properly entrained to the environment. Entrained peripheral clocks are thought to then regulate rhythmic gene expression in a cell-autonomous manner, that is, independently within each cell, to start tissue-specific circadian transcriptional programs that control the rhythmicity of biological processes. 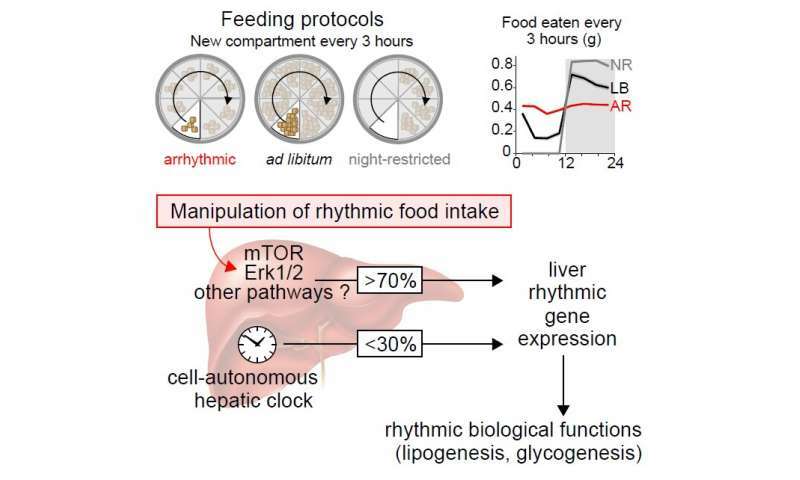 In contrast to current models, the new findings show that rhythmic food intake largely drives rhythmic gene expression independently of the cell-autonomous molecular clock in the liver. To examine the role of rhythmic food intake in circadian biology and rhythmic gene expression, Menet and his team fed mice arrhythmically, at night only, or in an unrestricted manner for five weeks, then collected the livers of the mice at different times of day and examined the expression of liver genes. Compared to unrestricted feeding, arrhythmic feeding disrupted oscillations in the expression of 70% of cycling liver genes without affecting the core molecular clock in the liver. Moreover, the timing of food intake regulated many metabolic pathways in the liver, including those involved in cholesterol and glycogen synthesis. Taken together, the findings suggest that the master circadian clock in the SCN does not act solely to synchronize peripheral circadian clocks but instead contributes more generally to circadian transcriptional programs throughout the body. In future studies, Menet and his team will examine whether the timing of food intake regulates rhythmic protein production, as well as rhythmic gene expression in various tissues. Another question for future research is whether other SCN-driven cues such as body temperature drive rhythmic gene expression in peripheral clocks. For now, the health implications of the new findings remain unclear. Clock disruptions have been associated with aging, altered responses to therapeutics, obesity, diabetes, mental health disorders, and cancer. According to the study authors, these effects could potentially be ameliorated by controlling the timing of food intake. "But one should not assume that because we observe a strong effect of rhythmic food intake in the liver of mouse, this also applies to other mouse tissues, and even to the human liver," Menet says.